Brain matter resembles jello in that shimmers and giggles, largely because it is predominantly fluids. This jello-like substance is enclosed in a bony structure, the skull. While the hard skull protects the brain from being crushed by some external forces, collision of the brain with the skull, causes other injury. We will categorize this as impact brain damage. Collisions between brain matter and the skull can occur from the head hitting an object, such as the pavement, the head being struck by something like a club or a hammer, or the head rapidly accelerating or decelerating, such as in whiplash. The later will show no signs of physical trauma and many times causes traumatic brain injury to go unnoticed or undiagnosed. Damage can also occur from the collision between the brain and the sharp and hard interior of the skull. 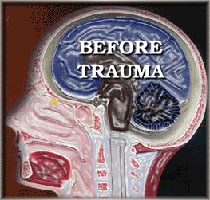 Damage can occur at the initial contact area and at the opposite site in the brain. Once set in motion, the brain will rebound within the skull. 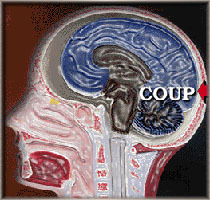 Thus, the terms coup, contracoup. The undersides of the brain, particularly the underside of the frontal lobes, are particularly at risk for injury, anytime the brain is forcefully set in motion, because of the bony ridges on the adjacent portions of the skull. This can occur regardless of the direction of the force which moves the brain. Contracoup- Coup occurs when there is damage tot he brain on both side. The side that received the impact and the side opposite of the blow. When the force of the blow is great enough to cause brain damage at the initial site and great enough to cause the brain to move in the opposite direction and hit the other side of the skull.